So, nothing from Sun? No classic et brilliant, “Trying to get to you” from 1955? That confidence and swagger? Elvis had dire taste in a great many areas, from food to Nixon, but he really understood and ‘felt’ for the then current black R&B. And must of been one of the first “rock” singers to pick up on Ray Charles (“I got a woman”). I remember you writing about Baby I Don’t Care on MM. Mystery Train is my favourite, but at Christmas I bought the 5-CD Seventies set which I’m enjoying and which proves it wasn’t all downhill after the Memphis sessions and Singer Special comeback. Maybe I’ll do something similar on my blog – very different choices of course. I don’t know how I could have left out “Mystery Train”. It’s probably his greatest record, from a certain perspective. But it’s not quite one of my 10 favourites. I too understand what John Lennon was getting at re Elvis and the army and, like you, don’t particularly agree. Much prefer his, “Before Elvis there was nothing.” Incidentally, although possibly not remembering it entirely correctly, I remember many years ago when you seemed to be responsible for writing the bulk of Melody Maker each week an article by you imagining a recording session involving Presley making a carefully considered album that was receiving significant input from one or more individuals and which promised to be the album we all wished he would make. It was written in a way that led the reader to believe it was true. When you expressed, ‘if only’ at the end of the piece, I remember clearly the disappointment I felt but feeling pleased that you and I’m sure many thousands of others, were as frustrated with Elvis’ general recorded output as I was. Surely “You’re So Square” IS from before the draft? Who can argue with your list, Richard, it’s such a subjective thing, everyone would have variations. Lennon was no doubt being poutily melodramatic if he indeed claimed the King’s bowing the knee to the US Army was “the day the music died” – but personally, I’d agree with him that “It’s Now or Never” is a teeth-grindingly corny rehash of an already borderline corndog, … and embarrassingly melodramatic. Just a question of personal taste, and all that. Personally, “All Shook Up” would have to be there. And “Suspicious Minds”. And the “Lonesome Tonight” where Elvis repeatedly corpses, cracking up at the gulf between the massively (over)sincere lyric and something trivial that has tickled him. 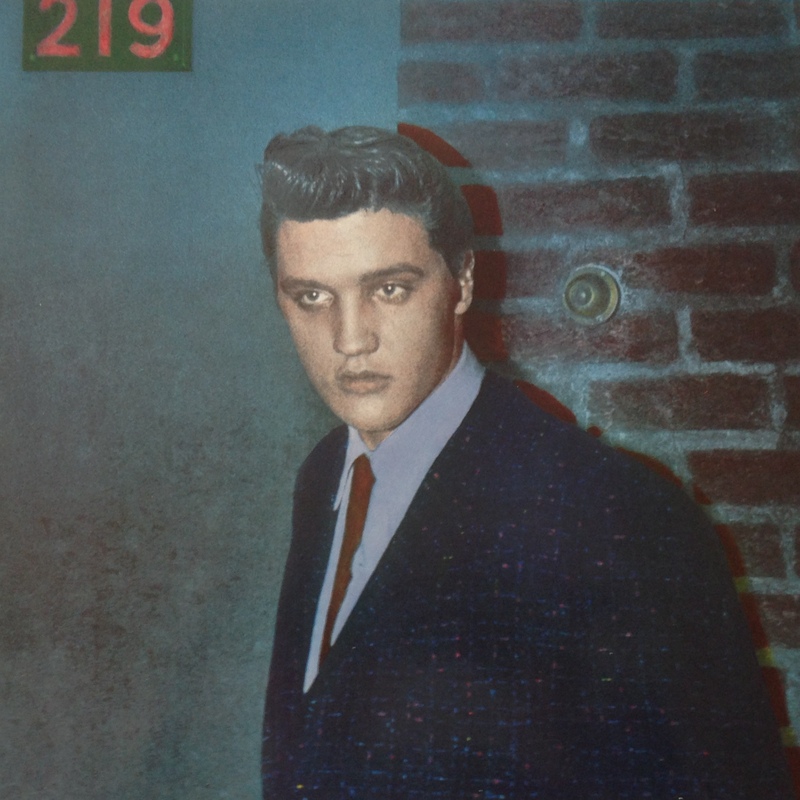 To me, the greatest achievement of Elvis is not the charisma, the haircuts or the pelvis (sociologically crucial though that combination was), and less still the suits or the political views …. but the way he took some of the best from either side of the great American apartheid divide between “majority” and “race” music, without appropriating either, and rendered his own mix of heritage memorably, musically. Woody Guthrie and Ramblin’ Jack Elliott and Bob are similarly meritorious, in a rather different musical mode, developing out of cowboy folk hollers blues rags. Many jazz musicians likewise, the ones who were not obviously “white” or “black” – neither painfully obviously one or painfully limited by the other – but simply outstanding in their own way. It was of course much harder for the poor ones, those discriminated against to become known in music. And to survive in life. Quite right about the date of Jailhouse Rock / “Baby I Don’t Care”. Now corrected. Interesting choices – but there are so many buried gems in the back catalogue. Even on the soundtracks. The Memphis and later Stax sessions yield some real gold. If you haven’t got it, – although I’m sure you probably have A Hundred Years From Now – Essential Elvis 4, is the album getting the highest amount of replays in our house. Undubbed masters from the Nashville sessions, which also includes studio banter, jams and works in progress. The build up and lead in to It’s Only Love are worth the price of admission alone. I see the Telegraph has generated a “picture” of Elvis at 80 along with a bunch of other dead rock stars. Janis Joplin morphs into Jilly Cooper, no real surprise there. I have an irrational love of ‘Pocketful of Rainbows’ from GI Blues. Hi, Richard. I remember clearly the first time I heard ‘Heartbreak Hotel’. It was in the 2Is coffee bar on Old Compton Street and I’d gone in on a break from working in the Joe Lyons tea shop on Picadilly – my job through sixth form. I’d put Sarah Vaughan & Billy Eckstein on to play and then Elvis, someone else’s choice, came on directly afterwards. I was gob-smacked, astounded; had never heard anything like it. Although there a couple of tracks here I don’t think I’ve heard, I pretty much agree, a great selection. Loved Elvis’s post-army poppier sides. I have always found his performance of “If I Can Dream” from the ’68 Comeback concert to be the one that hits me hardest. Frustrating as well when you think what he could have accomplished at Muscle Shoals or Stax or Atlantic. In 1976 I wrote a piece of fiction about a session at Criteria Studios in Miami which saw Elvis produced by Jerry Wexler, assisted by Tom Dowd and Arif Mardin. I chose the sidemen — Fathead Newman, Hank Crawford, Mel Lastie, Cornell Dupree, Lowell George, Steve Cropper, Barry Beckett, David Hood, Roger Hawkins — and the repertoire, including Randy Newman’s “Guilty”, Dan Penn’s “Nobody’s Fool” and “Stormy Monday Blues”. The piece appeared as a column in the Melody Maker. To my great satisfaction and amusement, the NME lifted the details and published them as a news story the following week. I would have liked Elvis to have had a crack at the slow late night jazz/Sinatra genre. There’s a song on Viva Las Vagas where he edges towards this and amost makes it, esp on the out-take. And that’s the film that has a weird cameo from Pete and Conte Candoli. A pub quiz question for jazz nerds! A delightfully eclectic list. I would have included I Need Somebody To Lean On from Viva Las Vegas too, along with Gentle On My Mind from 1969 Memphis sessions, For Old Times Sake (Stax), Mystery Train and his poignant cover of Tomorrow Is A Long Time. That said, I’m not sure which ones I’d omit from your list – which proves something I suppose. This is simply a great list. I babble about Dark Moon, which I have the LP set A Golden Celebration, to anyone who will listen. If I manage to keep their attention, I go on to explain that Elvis was MUCH more than just the Sun Sessions. If You Talk In Your Sleep is another towering performance from the Stax sessions. Cheers. I will always remember Ian Drury ( in a one off lecture to Goldsmiths College Music students in the late 80s on his musical influences) playing an unforgettably haunting version of ‘Blue Moon’ by … Elvis Presley. A great list although I haven’t heard ‘Dark Moon’ before. But surely not correct to say that ‘Girl of My Best Friend’ wasn’t released as a single until 1976. It was originally the B-side of ‘Mess of Blues’ in 1960 but became so popular it ended up making the UK top 10 in its own right that same year. My memory told me something like that, but I looked it up and couldn’t find a chart entry for it 1960, in its own right. It did, however, make No 9 when re-released as an A-side in 1976. Are you sure you’re not confusing those dates? This sent me up to my loft! The answer is, it depends on which chart you take. The NME chart for w/e September 17th 1960 shows both ‘Mess of Blues’ at no 3 and ‘Girl of My Best Friend’ at no 6. The NME was my Bible at the time so that’s the one I remembered. The MM chart for the same week only lists ‘Mess of Blues’ at no 2. Presumably the NME allowed for both sides of a single being listed separately, whereas the MM didn’t.